A huge wildfire which devastated the Canadian oil town of Fort McMurray could double in size over the next 24 hours, officials say. The blaze now covers an area larger than New York City and is being fanned by winds and feeding on dry vegetation. The flames are moving away from the town, most of whose inhabitants have reached safety. 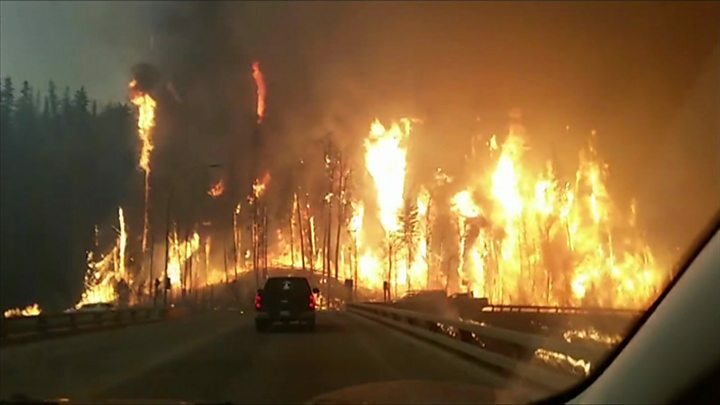 But many are still stuck north of Fort McMurray and evacuations by road and air are resuming. Thousands of people have been airlifted out but a mass convoy evacuating people from oil worker camps in the north was halted on Friday as huge flames flanked the road. The provincial government said on Friday that the fire had grown to 1,000 sq km (386 sq miles). Wildfire prevention manager Chad Morrison said there was a "high potential that the fire could double in size" by the end of Saturday. But he added that it would expand into a more remote forested area north-east of Fort McMurray. Dry conditions and 27C heat were expected during the day, but cooler temperatures would prevail and there was a possibility of rain on Sunday and Monday. The danger, said one officer, was "tentacles growing out of the fire", which could end up looping around and trapping people. There are no reports of injuries or deaths but several residents who may have survived the fire have apparently been spotted in Fort McMurray. Teams are now sweeping the city in case any homeless people were left behind. There is also concern about oil facilities, particularly near Nexen's Long Lake oil extraction site. "We're looking at a blast area of about 14 kilometres if that plant were to go," said Sgt Jack Poitras. The provincial government has declared a state of emergency and will provide C$100m ($77m) in cash to evacuees. Alberta Premier Rachel Notley said the damage was extensive and would take months to repair. She said: "The downtown is largely intact. The hospital is still standing. The telephone centre is intact. The water treatment centre is back up and running. Municipal buildings and the aeroplane remain intact." The city is in the heart of Canada's oil sands country, and the region has the world's third-largest reserves of oil. As much as a quarter of the country's oil production has been halted by the fire, raising concerns about the effect on the Canadian economy. "To those who have lost so much: we are resilient, we are Canadians, and we will make it through this difficult time, together," he said.